In this paper, we present a hybrid method for deciding problems involving integer and Boolean variables which is based on generic SAT solving techniques augmented with a) a polynomial-time ILP solver for the special class of Unit-Two-Variable-Per-Inequality (unit TVPI or UTVPI) constraints and b) an independent solver for general integer linear constraints. In our approach, we present a novel method for encoding linear constraints into the SAT solver through binary “indicator” variables. The hybrid SAT problem is subsequently solved using a SAT search procedure in close collaboration with the UTVPI solver. The UTVPI solver interacts closely with the Boolean SAT solver by passing implications and conflicting assignments. 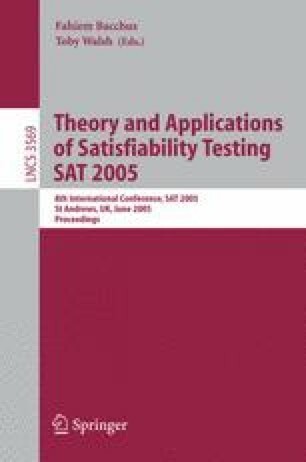 The non-UTVPI constraints are handled separately and participate in the learning scheme of the SAT solver through an innovative method based on the theory of cutting planes. Empirical evidence on software verification benchmarks is presented that demonstrates the advantages of our combined method.